Digestive Enzymes: Dr. Natasha Campbell-McBride introduces sauerkraut from day one on the GAPS Diet. Why is she such a strong proponent of this old-fashioned food? Because it's one of the strongest natural digestive enzymes in existence. Advertisements for Tums antacids will have you believe that the majority of people suffer from an overabundance of stomach acid, when actually the reverse is true. A deficiency in stomach acid makes food take longer to digest (and often incompletely digest), causing the symptoms that make Tums a bestseller. In addition, there's a domino effect in our digestive system, where one digestive process leads to the next. When we eat, the natural production of stomach acid stimulates the release of digestive enzymes from the pancreas and gallbladder into the small intestine. Together, they break down our food into absorbable nutrients. When stomach acid production is faulty, the other enzymes get released in smaller quantities as well, adding to our digestive woes. A little bit of sauerkraut before a meal stimulates the production of stomach acid (and therefore our other enzymes), preparing our body for the meal to come. Probiotics: If you've ever bought a probiotic supplement, you've seen the word lactobacilli. These bacteria exist on the surface of all living things (including cabbage) and during fermentation, they break down the starch and sugar in the cabbage and produce lactic acid, which is a natural preservative. That is how people thousands of years ago were able to preserve food without the use of refrigeration. At the same time, the lactobacilli multiply during fermentation, making sauerkraut a potent ally for our health. In our digestive tract, they: (1) protect us against viruses, pathogens and harmful bacteria; (2) help maintain a healthy internal pH; (3) neutralize toxins; (4) chelate heavy metals; (5) suppress cancer formation; (6) convert food into nutrition for the cells of our intestinal walls; and (7) help to prevent or heal leaky gut. They'e good friends to have. (Source: Gut and Psychology Syndrome by Natasha Campbell-Mcbride). Vitamins: Another piece of fermentation magic is that it increases both the amount and bioavailability of nutrients. Sauerkraut is exceptionally high in Vitamins C, B and K, has a substantial amount of calcium and magnesium, and contains both antioxidant and detoxifying compounds. It is definitely a superfood. Bubbies is the most popular brand of “raw” sauerkraut sold in health food stores. In my town, it costs $6 for a 25 oz. jar. 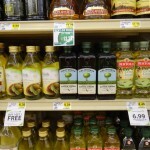 The cost per ounce is 24 cents, and since the sauerkraut is loosely packed, a good portion of each ounce is liquid. In addition, Bubbies is partially pasteurized & fermented only a short period of time. Both of these steps reduce its probiotic benefit. 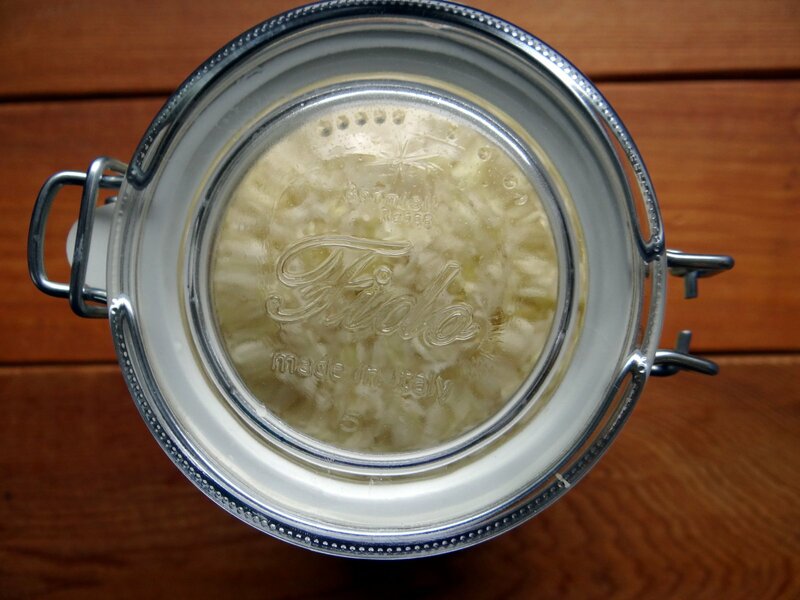 This recipe for homemade sauerkraut is truly raw, long fermented and full of probiotic goodness. 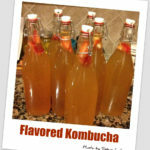 When it comes to fermenting foods at home, I look for easy and foolproof options. Sauerkraut doesn't usually fall within that definition. Many friends have tried and failed to make this superfood over the years, either battling mold, funky smells or strange tastes. Honestly, their failures scared me a way, so I bought my sauerkraut, and that gets expensive. 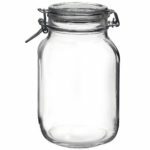 Then I read two articles that changed my perspective: Lea of Nourishing Treasures wrote about a special jar that provides the perfect fermentation vessel. It keeps the bad stuff out and the good stuff in, all with no need to weigh down the cabbage. End result: tasty, probiotic-rich, sauerkraut every time. Kim of Nourishing Gourmet wrote about a no-pound method, where there's no need to spend fifteen minutes beating up your cabbage before putting it in the jar. Put those two tips together, and you have my kind of recipe! Wash your hands and be sure all of your equipment is clean. Cut cabbage in half and remove the cores. If the outer leaves are wilted, throw them away. Cut the remaining cabbage into large chunks and feed into your food processor, using the largest grater blade, or a slicing blade, to shred the cabbage. If you don't have a food processor, chop the cabbage finely with a knife. Transfer the shredded/chopped cabbage to a large bowl. Sprinkle with 3 Tbsp. salt and use two spoons to toss until the salt evenly coats the cabbage. Transfer the cabbage to your Fido jar. It won't all fit at first. That's OK – leave the extra in the bowl, and it will get added later. Cover both the jar and bowl with clean dry cloths, and let the cabbage “sweat” for 30 minutes. Once the 30 minutes have passed, use a large spoon or meat pounder to gently push down on the cabbage in the jar. It will compress and release its natural juices, freeing up more room in the jar. Add the remaining cabbage from the bowl and set the timer for another 30 minutes. Compress the cabbage again. Its natural juices should rise up above the shredded cabbage itself. If it doesn't, you can add a little water as needed. Leave two inches of airspace at the top of the jar. Put a piece of tape on the jar with today's date, and set it out of sunlight, but someplace you won't forget about it. Let it ferment for 30 days. Don't open the jar during fermentation. If your house runs hot, ferment it 3 weeks. If your house runs cold, let it ferment 5 weeks. The best flavor and nutrient content develops between 60-75 degrees. Don't try to ferment in temperatures above 80 degrees, or the wrong type of bacteria takes over. Transfer the kraut into smaller containers and refrigerate. I eat mine in a month, but it should keep in the fridge for at least 6 months. If you've only eaten storebought sauerkraut before, or have done shorter ferments at home, start slowly when eating this version. It has a much higher probiotic count and can cause a die-off reaction if you eat too much too fast. Start with just a teaspoon, and work your way up to 1-2 Tbsp. per meal. 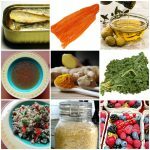 Fermented foods are meant to be condiments, not major food groups. A little bit goes a long way. 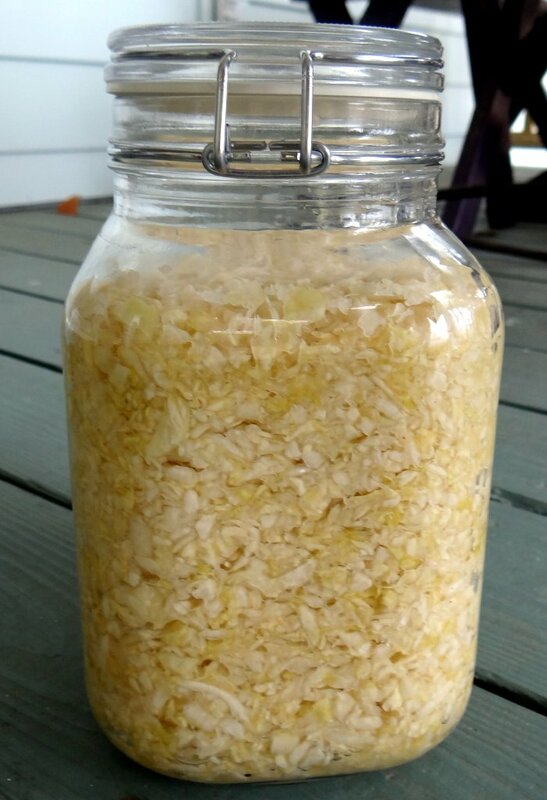 Many internet recipes for homemade sauerkraut use a short fermentation time of 3-7 days, but the fermentation process has hardly begun at that point. There are three stages of lacto-fermentation. This website shows that it takes about 20 days for all 3 stages to be reached. Traditional sauerkraut recipes have the fermentation time at 3-5 weeks, depending on room temperature. If you don't have a Fido jar, you can still use this no-pound method in your preferred fermentation vessels. However, you will have to use a weight, and it's no longer a no-fail method.